Made with 100% acrylic for maximum warmth, this quality scarf from our 2019 NSW Supporters range is lightweight, brightly coloured and ideal for those chilly nights at the game. A good scarf is important at a State of Origin game, not just to show who you barrack for, but to keep you warm on those colder nights in the stands. 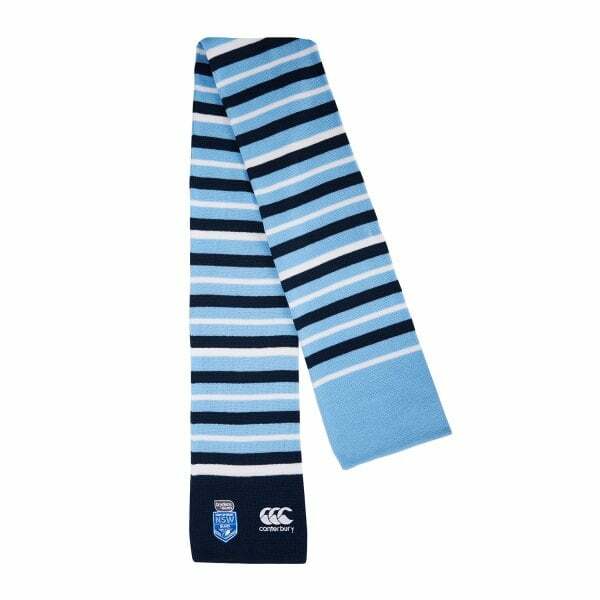 Made with 100% acrylic yarn, Canterbury’s Stripe Scarf from our 2019 NSW Supporters collection will keep the cold out while you cheer on the Blues. A bright yarn dye stripe scarf with contrast panels at opposite ends, it features a vintage style badge at one end celebrating the Blues since 1908. It also carries the iconic CCC logo, revealing your membership of the Canterbury community. Practical supporters wear that keeps you warm and makes a bold statement, available now at Canterbury.